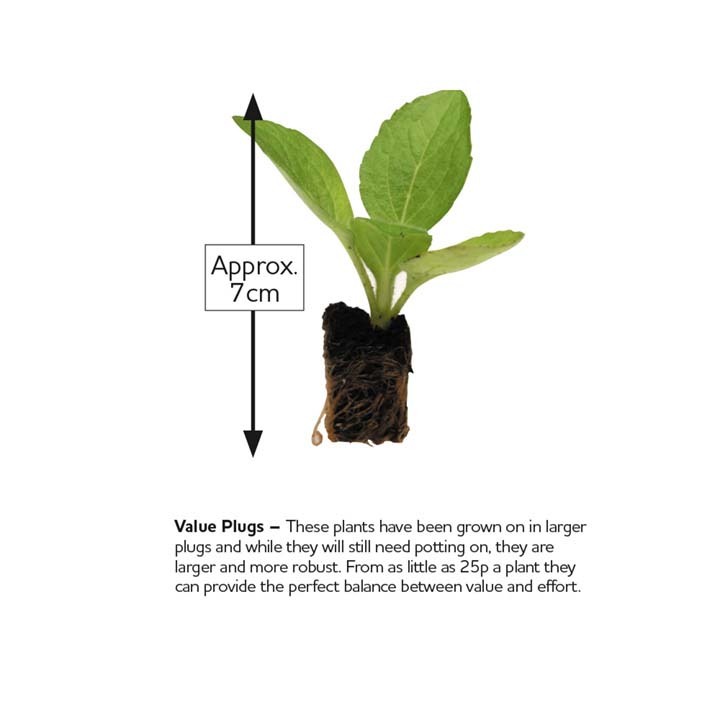 Extra Value Plug Plants - A 7cm pot filled loosely with moist compost is ideal to plant these sturdy young plants into. In each pack you will find a dibber stick. 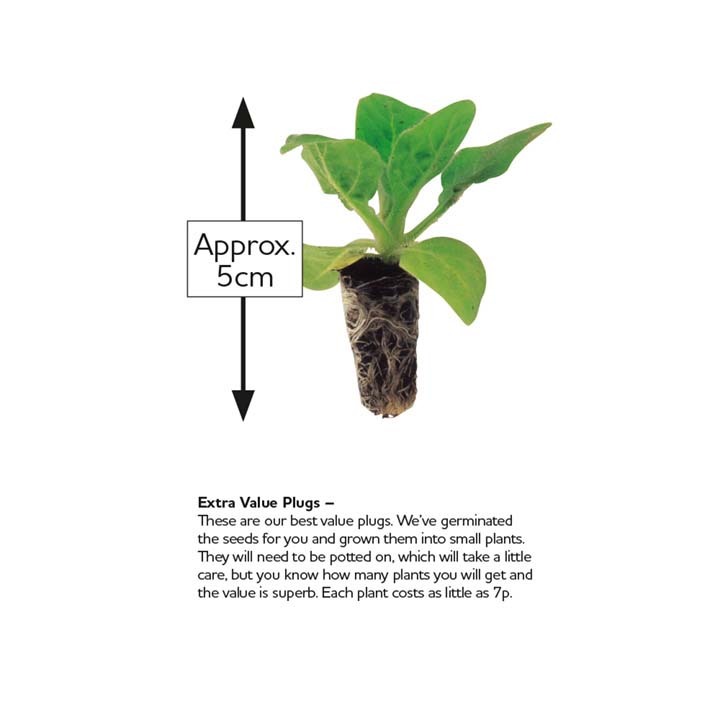 Gently push it through the base hole of each cell and ease the plant and root plug out of the tray, placing it into the centre of the filled pot until the roots of the plug are covered. 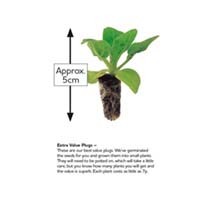 Firm the compost gently around the base of the plug whilst ensuring the stem and leaves remain above the top layer. Alternatively, plant into trays of compost. 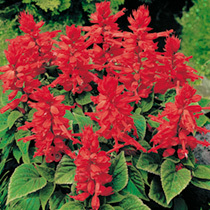 A 36x22cm (14x8½") tray will hold up to 24 plants. Grow on in a light place at a temperature of 16°C (60°F). For Begonia and impatiens 18°C (65°F) would be even better to encourage quick establishment. HINT: To reduce the need for weeding once you have planted out your bedding display, you can dig over your planting area a couple of weeks before you intend to plant. As the soil warms this willencourage the weed seeds to germinate and these can be removed before you plant up your display. Value Plug Plants - These larger cell grown plants will develop very quickly once planted in 7 to 9cm pots. Ease them from their tray using the dibber stick provided, pushing through the base hole of each cell, then plant into the centre of the pot ensuring all the roots are covered but that the stem and leaves remain exposed. Alternatively, plant into trays of compost. 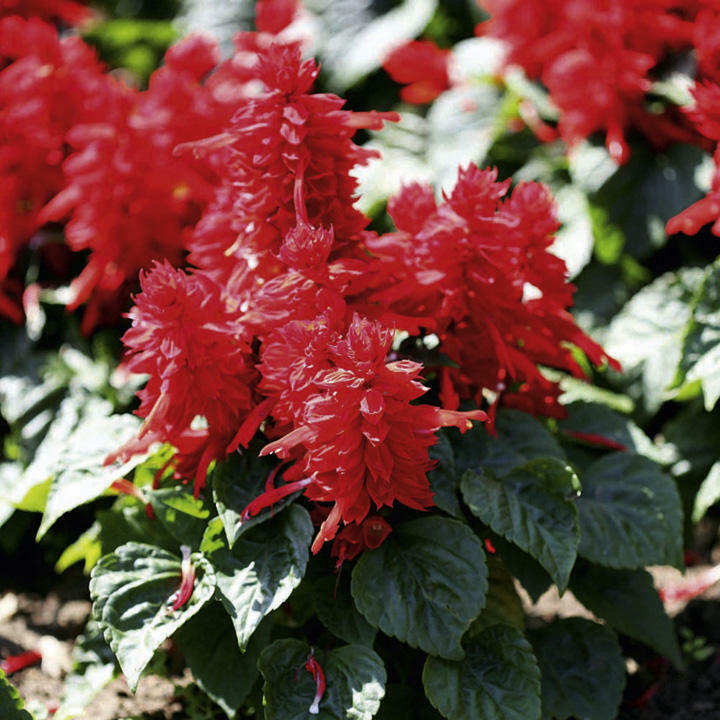 Begonias and impatiens should ideally be grown on at a minimum temperature of 18°C (65°F). For other plants 16°C (60°F) would be suitable. 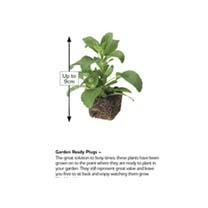 Garden Ready Plug Plants - Always ensure that the risk of frost has passed before you plant these into the garden. Should there still be a risk in your area then we suggest that you pot these plants into a 7 to 9cm pot and allow them to develop further somewhere warm and light, before planting, rather than leave them in the growing tray.